The wedding dress - He's proposed and it is time to make a decision on the most important detail of every girl's dream: her wedding dress. Should it be sleeveless, short, long, lacey, sequined or plain? So many questions to ask yourself, although you are sure of one thing, your dress needs to be perfect. As soon as the planning begins for your wedding day, choosing your wedding dress becomes somewhat of an urgency for most brides, who do not want to wait until the last minute. Be sure to allow yourself plenty of time to try on different styles of wedding dresses until you find the one which says "you". The theme of your wedding will be an important point when selecting that special dress. Are you getting married outdoors? If so, you might choose a light airy style. Have you decided on a formal wedding? Then by all means, go all out and wear a white dress covered in silk and lace. Whatever type of occasion your wedding will be, your dress will play one of the most important roles in it! It's also important to think about the month and season you are getting married in. If you are having a middle of summer wedding, then you probably shouldn't wear a wedding dress with double layers or long sleeves. After all, this is supposed to be the most memorable day of your beginning together. You don't want the biggest memory to be how much you perspired throughout the ceremony! When choosing a wedding dress, try on various comfortable styles. Walk around in them, if kneeling is part of your ceremony, then kneel in the dress and be sure you are not going to be uncomfortable in your choice. The beauty of the dress is only half of your decision-the other half is that you should look beautiful, happy and elegant. You cannot look happy if you are holding your breath so seams do not pop or you're itchy from the lace on your arms. One mistake that a lot of brides tend to make when choosing a wedding dress is with the size. If you are planning on losing weight before your big day, do not buy a dress in the size you hope you may be on your wedding day. Instead buy the size you are on the day that you choose the dress. It will always be easier to take-in a dress if it is too big, than to add material for a dress that ended up being too small! With the expense of weddings, some couples try and cut back by making their own flowers, having a family member bake the wedding cake or hiring a friend to take wedding photos. Although it is okay to cut back and still have your dream wedding, don't skimp when choosing your wedding dress. If you cannot afford to select a dress from a designer wedding boutique and pay their prices, try wedding consignment shops, department stores or browse the internet for suppliers who offer 'clearance', 'end of range' or 'like new' dresses at an affordable price. Whatever style, colour or price range you decide on when choosing your wedding dress, remember that you are still "You" and that is who your fiancé fell in love with, not your dress, which will only add to the ambiance of your day. 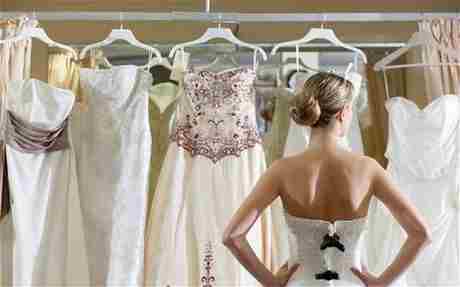 After you have chosen your wedding dress hang it in the bag that it comes in and do not over show it. Leave guests something to look forward to as they see you for the first time walking down the aisle. And unless it is unavoidable, do not let your future husband see your dress at all before the wedding - tradition says it's bad luck!